After winning it all as 8th grader, Choma wants to finish her career at Eastport-South Manor with another state title. 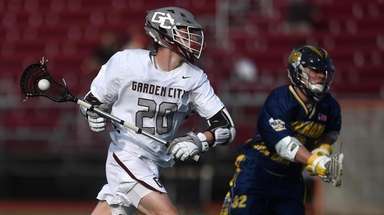 As hard as dealing with faceguards can be on a game-by-game basis, Kasey Choma has learned to find value in every moment spent watching. 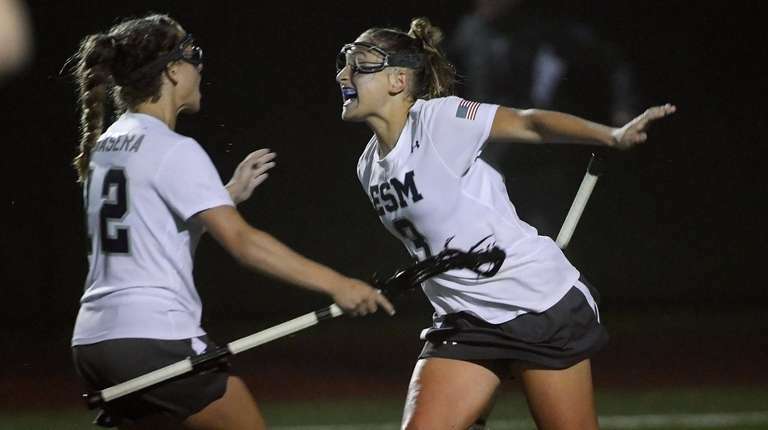 The Eastport-South Manor senior committed to Notre Dame said she can remember drawing a faceguard in 14 of 18 games last year, the last time coming against Manhasset in the Long Island Class B girls lacrosse championship game. Manhasset beat the Sharks, 11-10, en route to a state Class B title, and now Choma is focused on ending her high school career with a championship of her own. She won as an eighth grader in 2015, but a return trip to Cortland thus far has proved elusive. A faceguard is meant to neutralize the opposing team’s most dangerous offensive threat. When it comes this year, Choma will be better prepared to handle it than in the past. She was never impatient, but always itched to get involved. Instead, she’ll let her teammates go to work while she offers instruction from behind the play. “Obviously, it stinks,” said Choma, who scored 45 goals last year and defeated West Babylon in the county title game. “I just want to play. It’s a complement to be faceguarded, but in a way, it stinks. I just want to be able to go out there and freelance and play my own game. Patience is partly why Choma has matured since Thorn first met her as a sixth grader. She tore her ACL during the last regular season game of her freshman year and proceeded to go to physical therapy for more than two years, despite returning to the field in eight months. She doesn’t stress a lack of involvement anymore, either, because she knows those split-second plays will be there. Choma heads a midfield that lost Virginia commit Jaime Biskup for the season with a torn left ACL, Thorn said. Biskup, another senior leader, is now considered one of Thorn’s assistant coaches, and although Choma said Biskup is a major loss, there’s enough talent on the roster to make things work. Ellie Masera, Olivia Arntsen, Jess Northrop, Marisa Tancrevi, Sammy Filippi and Olivia Cosgrove will factor into the team’s attack, while Maryland commit Catherine Flaherty heads a defense that includes Alexandra Giacolone, Celeste Forte, Bella D’Gracia and Alyssa Natoli. This group will face stiff competition from West Babylon, which boasts arguably the top midfield on Long Island with Kayla Downey, Emily Heller and Hannah Heller running the show. West Islip, the defending Long Island Class A champion, is new to Class B this year and will be another test for the Sharks. Choma said she’s ready for the competition. Come June, she hopes to not be watching as other teams chase that coveted state title. 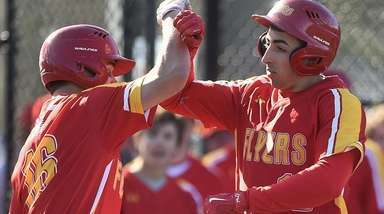 With West Islip down to Division II, Northport, Riverhead, Ward Melville and Middle Country represent the upper echelon of Division I programs. 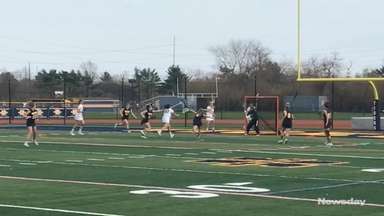 Northport’s Olivia Carner, a Duke commit, is one of the best pure dodgers on Long Island, while Riverhead’s Kayla Kielbasa is an all-around contributor and is headed to Penn State. 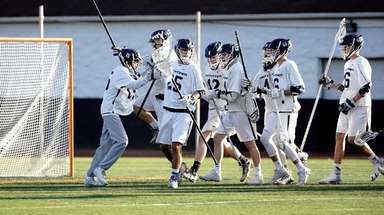 Mount Sinai fell to Cold Spring Harbor in the Long Island Class C championship and is in the mix along with Bayport-Blue Point, Rocky Point and Westhampton to represent Suffolk in the game again. This is often one of the most competitive races on the Island. Mattituck/Southold is the defending state Class D champion but will face competition from Babylon and standout attack Emma Ward. The Hoeg sisters — Mackenzie and Riley — lead the Tuckers, who return their top three point-scorers. 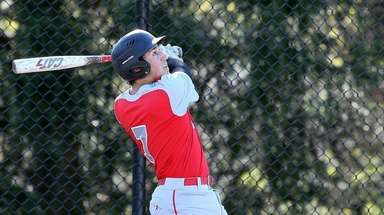 Babylon improved greatly throughout last spring, putting the Panthers in the discussion.